Diamond smart flowerpot takes care of your plants through automatic watering. Adjust number of watering per week on its touch panel so you can travel even for month! The internal water reservoir is enough for more the 2 month. Also its decorative light makes it a shining diamond in your house. 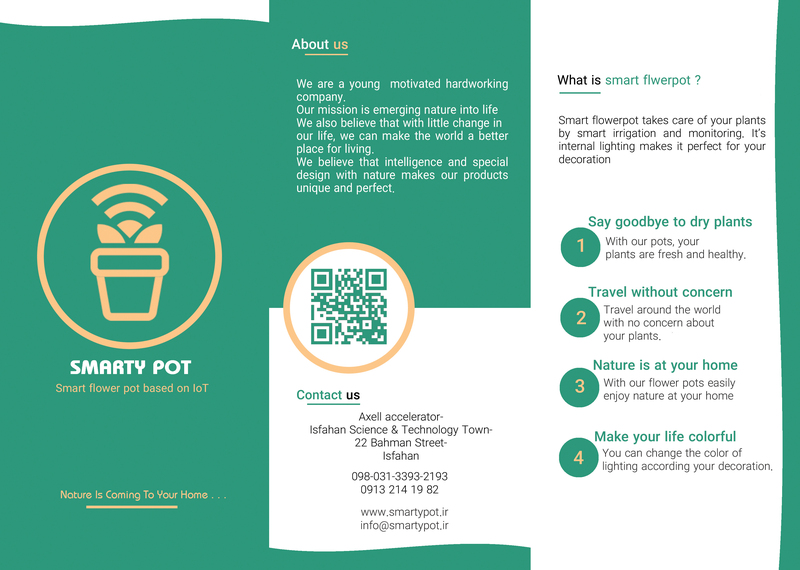 Everything you need to grow and keep a plant, is in Smartypot application. Just open it and you reach all the information about plants. Also Sadaf flowerpot talk to you through this app. You can Monitor tempreture, soil humidity and light level everytime you want. What do you want from Smartypot? Smartypot provides smart flower pots that takes care of house plants. We aimed to bring nature into your life. We designed our products to achieve our goals through facilitating flower care. Our product, is a smart connected flower pot that monitors environmental conditions of flowers on smart phone application and irrigates the flowers based on flower type and environmental conditions. Moreover, our smart pot’s decorative lighting can help make your home extra warm and inviting. We plan to extend our work to build a smart house gardens to enable everyone to grow fresh edible plants with zero effort.